Welcome to my first blog post! My obsession with baking has been getting a bit out of hand recently and I’m sure everyone has been beginning to become a bit fed up with my endless posts on Facebook so I’ve decided to start a blog to chart my adventures in baking. Today has been absolutely freezing. F. R. E. E. Z. I. N. G! So there was only one thing to do. BAKE! 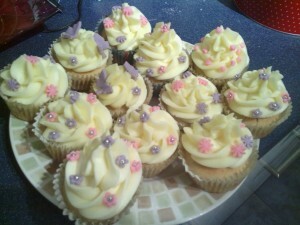 It is my gorgeous Goddaughter’s 2nd birthday party tomorrow and I offered to make some cupcakes for the occasion. I decided to go for a simple design and to decorate them using some simple sugarcraft shapes. About a year ago I went on a cupcake course which was great and filled me with lots of inspiration Cue a flurry of buying lots of sugarcraft tools which have since sat in the cupboard unused. I’m still thinking about doing a proper sugarcraft course or going on a cake decorating course (rather than cupcakes) and would like to get round to doing something in the not so distant future. I openly admit that I struggle with cupcakes. They always turn out dry and heavy rather than fluffy and moist. For Jessica’s birthday cupcakes I decided to try the Primrose Bakery vanilla cupcake recipe and top them with vanilla buttercream. I never know how to decorate cupcakes – I am not the best with colour combinations – so I decided to go for girlie lilac and pink decorations. I have to say I am quite pleased with how they’ve turned out – I just hope they taste ok. 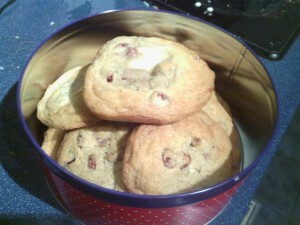 I also decided to bake some cookies. Before Christmas I became a little bit obsessed with cranberries and this has continued post Christmas. For Christmas I received the Hummingbird Bakery ‘Cake Days’ recipe book and decided to try the cranberry and white chocolate cookie recipe. It didn’t get off to a good start when half way through making them I realised that I didn’t have any baking paper – grrrrr. They turned out ok but I think I left them in just a bit too long as they are a little on the crunchy side rather than chewy. We have friends staying this weekend who have sampled the cupcakes and cookies and apparently they are ok! P.S. Apologies for the dodgy mobile phone photos – one of my aims is to improve the photography of my creations!